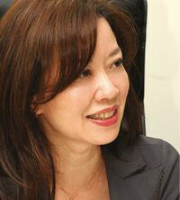 Charmayne Ong Poh Yin was admitted as a partner of SKRINE in 1996. She is a registered patent agent, design agent and trademark agent in Malaysia. She is the head of SKRINE’s IP division and is in charge of both the trademarks registration practice group and the IT and e-commerce practice group. Ms Ong Poh Yin’s areas of practice include managing the registration of trademarks and general advisory work relating to the classic forms of IP rights: trademarks, copyright, industrial design rights and patents. Her experience has involved advising on and drafting contracts in intellectual property (eg, licensing, franchising, distributorships, contract manufacturing and technology transfers). She is also familiar with IT and e-commerce matters, having been involved in cases relating to e-commerce, internet banking, cyber laws, communications and multimedia. Ms Ong Poh Yin was named as one of AsiaLaw’s Leading Lawyers for intellectual property (2009-2012, 2014-2018). She has been listed as a leading individual in Legal 500 Asia Pacific for information technology and telecommunications (2008-2017). She is also listed as a leading individual in intellectual property by Chambers Asia Pacific (2009-2018) and was recognised by Who’s Who Legal as one of the best legal practitioners in Malaysia in the fields of information technology and technology, media and telecommunications (2014, 2016 and 2017).